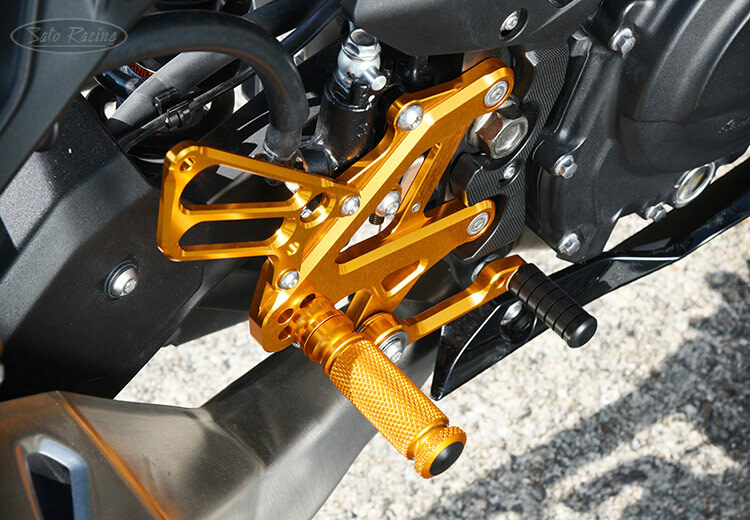 SATO RACING Rear Sets for 2018 Kawasaki Ninja 400 (along with the non-U.S. Ninja 250) is a track-engineered design, CNC-machined out of high strength billet aluminum and anodized in your choice of deep Black or vivid Gold finish. 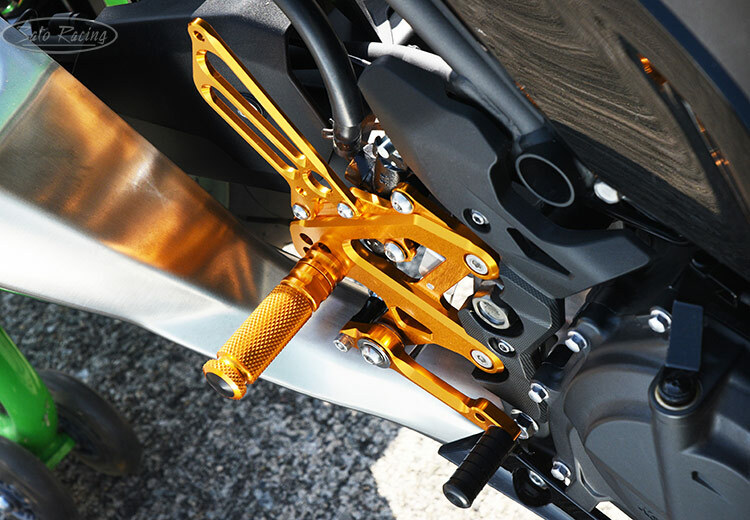 Provides 4 adjustable foot peg mounting positions, bringing your feet up and back compared to the stock foot pegs, for a sportier, more aggressive riding position that is ideal for the fast straights and steep lean angles encountered on the track. Can be set up for stock or reverse shift pattern. 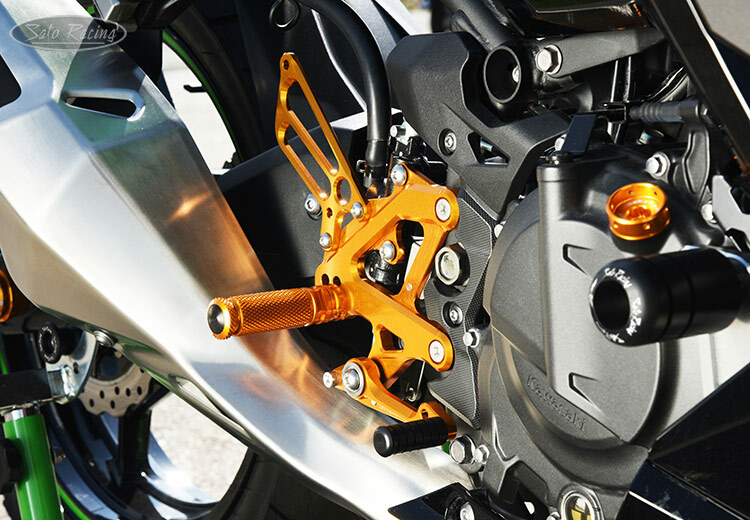 This 'street'-friendly Rear Sets design is compatible with the stock brake light switch and ABS. Japan-spec 2018 Ninja 250. 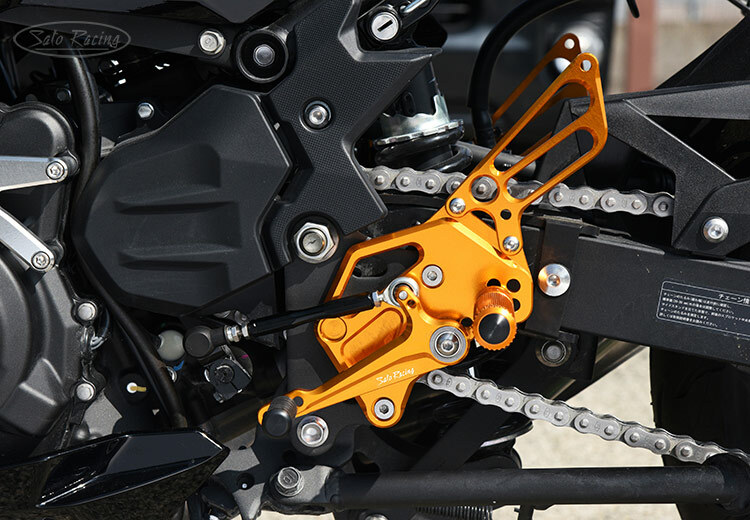 The U.S.-spec Ninja 400 is similar. 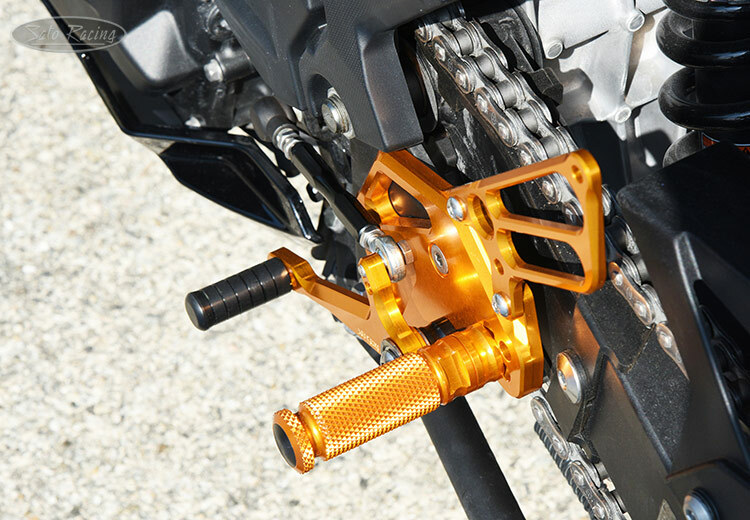 The position of the Foot Peg is adjustable 4 ways. The Pedal Tip position is also adjustable. These Rear Sets can be used with the stock rear brake light switch hardware. The standard Pedal Tips are made of tough, abrasion-resistant Delrin. We also offer several other Pedal Tip styles, such as Black or Gold-anodized Aluminum Pedal Tips with replaceable Rubber grips, and spring-loaded Folding-Style Aluminum Pedal Tips. These optional Pedal Tip styles are available separately, or we can substitute them in the Rear Sets kit for a small additional charge. 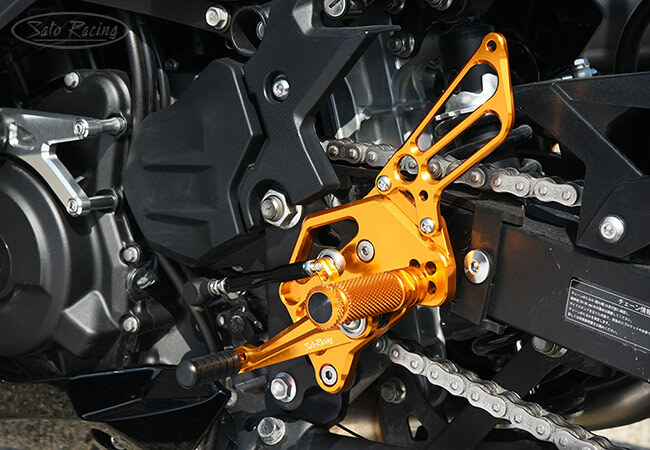 These Rear Sets can be set up for standard or reverse shift pattern by flipping the change arm. The shift pedal utilizes miniature double stainless bearings for smooth, precise shift action. 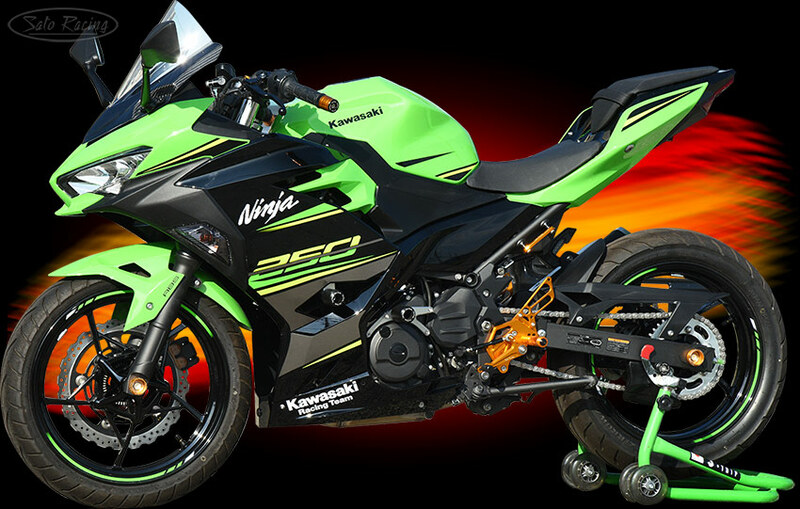 2018 Ninja 250 (Japan spec) with SATO RACING Rear Sets, Frame Sliders, Engine Sliders, Bar Ends and other parts.